Diabetes can increase the risk of serious problems to your teeth and gums. Diabetics who have problems controlling their blood sugar levels can be more susceptible to gum problems such as periodontal disease. Dental problems can happen to everyone but those who suffer from uncontrolled diabetes can find themselves susceptible to serious oral problems. The higher the levels of glucose in the bloodstream the higher the chance of dental problems occurring. Uncontrolled diabetes leads to an insufficient amount of white blood cells. A lack of white blood cells will make it harder for the body’s defence system to fight infection. This can lead to many dental problems such as periodontal disease and dry mouth problems. It is not always the case that people with diabetes will suffer from dental problems. People who control their diabetes should already know the problems that can occur when sugar levels are left unchecked. People who are well aware of these issues will usually maintain strict diets and take adequate medical precautions. In a lot of ways those who control their diabetes are more informed and less likely to suffer from dental problems. 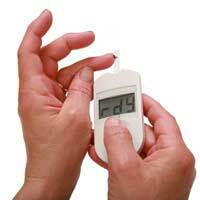 Problems are more likely when blood sugar levels are uncontrolled. It’s a fact that smokers who have diabetes will have an even higher risk of dental problems such as oral infections including periodontitis. The risk to diabetics who smoke is around 20 times higher than those who do not smoke. It is well known that smoking impairs the flow of blood and can affect healing after dental procedures. This risk is also likely to increase for smokers over the age of 45. Uncontrolled diabetes can mean an increase towards the risk of tooth loss. Diseases such as periodontal disease and gingivitis are serious dental problems if left unchecked. The infection can spread to the bones in the jaw that hold the teeth. These infections are very treatable if caught in the early stages. There may also be healing problems caused by the diabetes that can occur after surgery. There will be certain after care instructions that should be followed very closely to assist the healing process. Diabetics will need to take extra precautions when it comes to dental treatments. Dentists will need to be aware of the patient’s condition and how well controlled it is. Dentists will need to know of any prior hypoglycaemic episodes and the frequency at which these episodes occur. Dentists should also hold details of the patient’s doctor and hold information on the types of medicine they are taking to control the diabetes. The diabetic’s doctor should also be informed of any major dental treatments before they are due to take place. It is not always the case that diabetes will definitely lead to dental problems. For those who control their diabetes the risk of dental problems should be similar to non sufferers. But adequate medical care should always be taken when it comes to diabetes. Dentists and doctors will be able to give the best advice and information on ways to minimise the risk of medical and dental problems for those who suffer from this disease.